Contract: Collect and track costs, labor hours, revenue, and billing for services performed for and reimbursed by a client. Indirect: Collect and track expenditure item costs and labor hours for overhead activities, such as administrative and overhead work, marketing, and bid & proposal preparation. Capital: Collect and track costs and labor hours for asset development activities that you plan to capitalize as one or more assets. 1. Operating Unit: This is a new Feature R12. You can now define your Project Types on an Operating Unit basis. 2. Enter a name & Description for the Project type. 5. Service Type: Select the required service type from the list of values. 6. Work Type: Select the work type created above in the setup. Allows Cost Budget Entry- You will need to enable this if you wish to enter Cost Budgets against the Projects which have been created using the above Project Type. Select the Appropriate Entry Method and Resource List. Resource List for Status Reporting: The default resource list to use for summarizing project amounts for status reporting. You must enter a value to ensure that you can view information in the Project Status windows and project status reports, even when you have not baselined a budget for the project. You typically select the same resource list as one of the resource lists you use for budgeting. 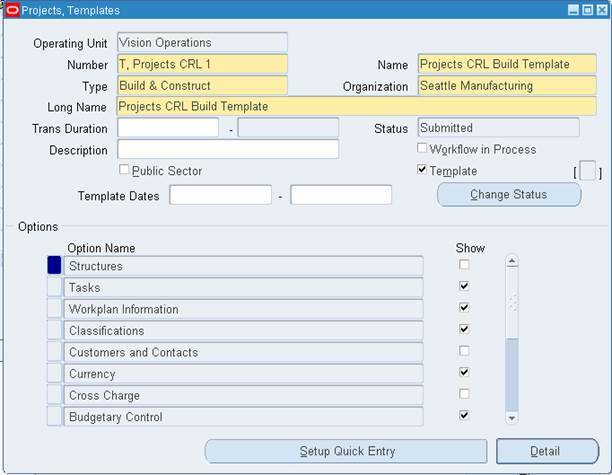 When you create a new project template from scratch, Oracle Projects automatically creates a resource list assignment using this resource list. Cost Type: For the project type, specifies whether to capitalize costs at their burdened or raw cost amount. Require Complete Asset Definition: Specifies whether an asset definition in Oracle Projects must be complete before you can interface costs to Oracle Assets. If you select this option, you do not need to enter information for the imported asset line in the Prepare Mass Additions window in Oracle Assets. The Asset Interface process places asset lines with complete definitions directly into the Post queue in Oracle Assets. Is Override Asset Assignment selected? Does the system call the client extension? You can set up the Asset Assignment extension to assign any unassigned asset lines that result from the Generate Asset Lines process, or (as described above) to override the current asset assignment for specified lines. See: Asset Assignment Extension, Oracle Projects APIs, Client Extensions, and Open Interfaces Reference. Asset Cost Allocation Method: You can select one of several predefined allocation methods to automatically distribute indirect and common costs across multiple assets. See: Allocating Asset Costs, Oracle Project Costing User Guide. Event Processing Method: You can specify a capital event processing method to control how assets and costs are grouped over time. You can choose to use either periodic or manual events. 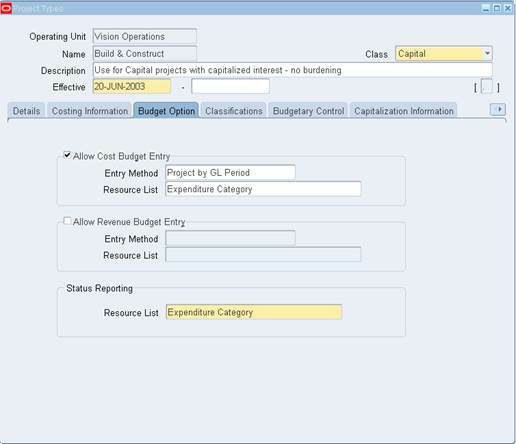 See: Creating Capital Events, Oracle Project Costing User Guide. 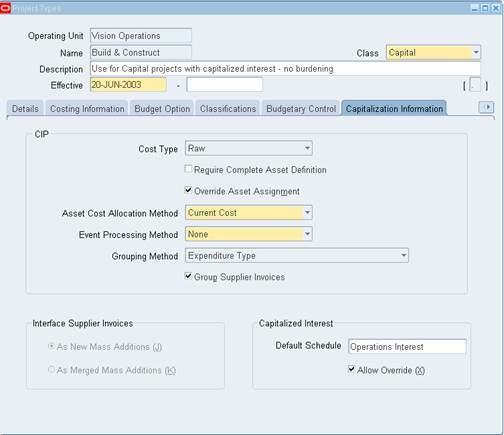 As New Mass Additions: Interfaces each expenditure item on a supplier invoice line to Oracle Assets as a separate Mass Addition line. Each line has the status NEW. As Merged Mass Additions: Interfaces each supplier invoice line to Oracle Assets as a separate Mass Addition line with the status MERGED. Note: After lines are interfaced to Oracle Assets, you can use the Prepare Mass Additions window in Oracle Assets to split, merge, or unmerge the lines manually. Capitalized Interest Default Schedule: Use this field to specify a default interest rate schedule for capitalized interest. 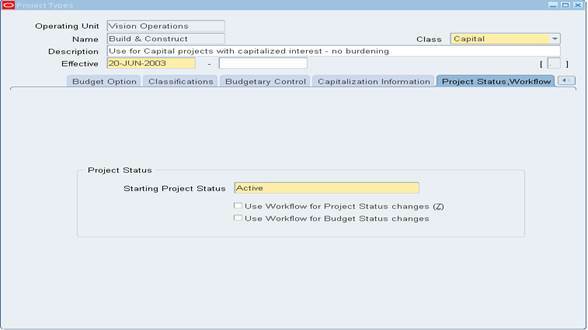 See: Defining Capitalized Interest Rate Schedules, Oracle Project Costing User Guide. 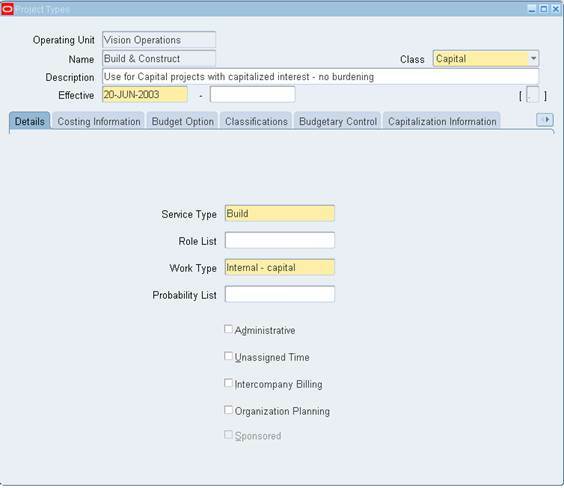 Capitalized Interest Allow Override: Select this check box to allow override of the default capitalized interest rate schedule at the project level. A project template is created. A project is created by copying an existing project or project template. The project status of the new project is the same as the current status of the existing project or project template, unless that starting project status is invalid for the project type. In that case, the starting project status set in the Starting Project Status field for the project type. Use Workflow for Project Status changes: Select to initiate Workflow for all workflow-eligible project statuses in projects with this project type. Use Workflow for Budget Status changes: Select to initiate Workflow for all eligible project budgets in projects with this project type. 1. Operating Unit: It’s a new feature in R12. You can define your Project Types based on Operating Units. It means that from a single responsibility you can Define/Query Multiple Operating Unit based Project Template Set Ups. The same feature was not available in previous releases. 2. Enter a name and number for Project Template. 3. Type: Select the project type to be used with this template. 4. Organization: Select the organization, to which the template belongs .This organization defaults when a project is created, can be overridden as per requirement. 5. Long Name can be same as your Template Name. 6. Optionally enter the Trans duration start and end dates. 7. Description can be same as your Long Name. 8. Show Checkbox: You can check the check box if you wish the Options to get copied over to the projects that you create using the same Template. 9. Oracle by defaults enables standard project options. You can update a project template at any time. All changes to a project template affect projects that are created from the template after the changes are made. 10. Click on the Setup Quick Entry: Quick Entry fields which specify fields to enter for the new project when creating it from a template.